In this corner, with 18 locations throughout Atlanta, the dean of Atlanta sports bars, Taco Mac. 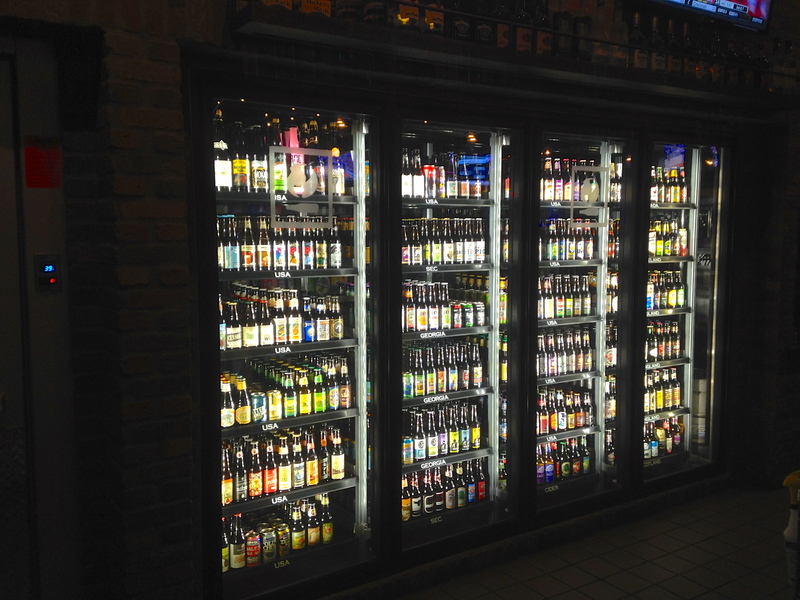 And in this corner, the upstart challenger, with two locations in Atlanta (and a third on the way), the World of Beer. Date Night recently visited both chains, the T. Mac at Cumberland and the World of Beer in Kennesaw. Both have been open for about a month. Who will win our award for best sports bar? Taco Mac is in the middle of a rebranding as T. Mac. The Cumberland restaurant is the newest and is a preview of T. Macs to come. It used to be Don Pablo’s Mexican restaurant right next to Copeland’s. Clever touch: it’s about a mile away from the new Braves stadium in Cobb County. This place is going to be packed on game nights. 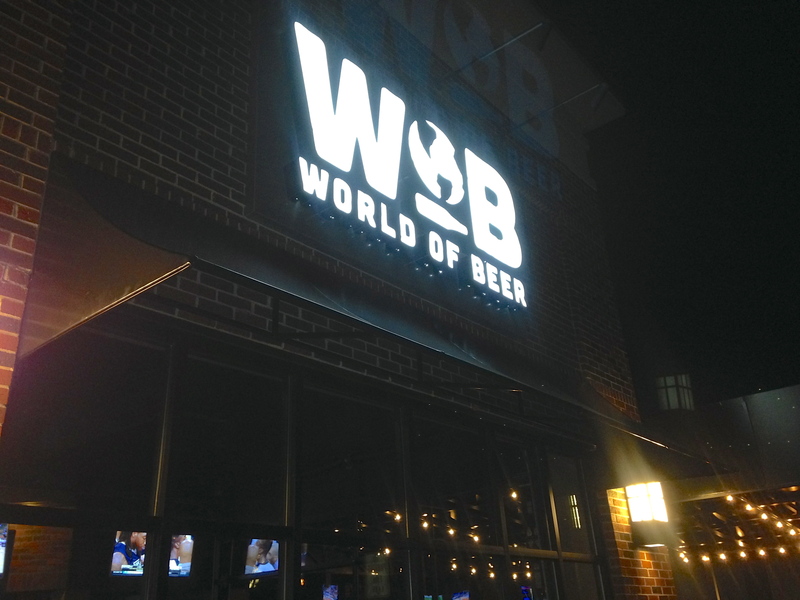 World of Beer started in Tampa and is spreading all over the east coast, opening up 20 new spots in the next few months. Ironically, the Kennesaw location is right down the street from a T. Mac. When I ask the regional manager about this, he says that the craft beer market is big enough to support both places. Time will tell. Hopefully, the students at nearby Kennesaw State are thirsty. Advantage: T. Mac. With 18 locations, there’s probably one near you. At T. Mac, you feel like you are in a sports club. 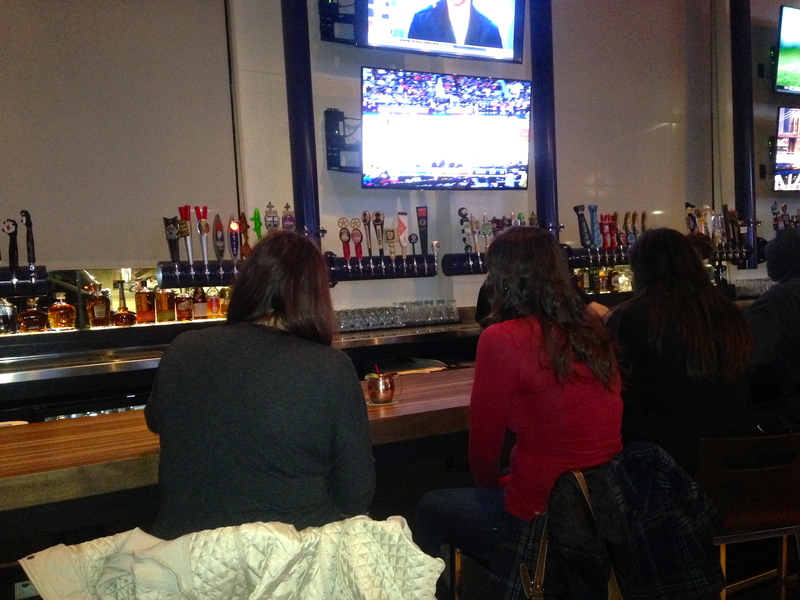 There are lots of booths so you can hang with your pals while watching the game. 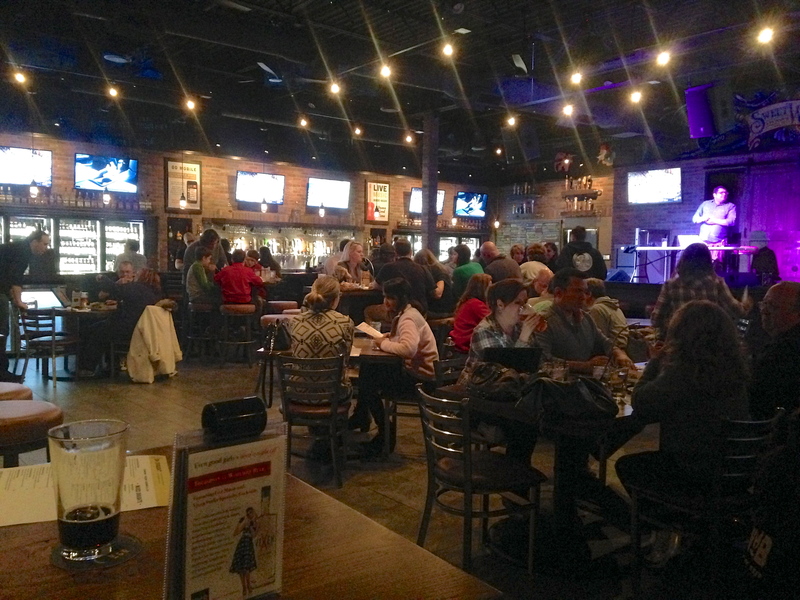 The night we visit World of Beer, there is an annoying trivia contest going on. It’s loud and you can’t talk because of the trivia. There weren’t enough people doing the trivia to justify the gimmick. Advantage: T. Mac. No trivia contests needed here. T. Mac has more televisions than a Las Vegas casino sports book. Every booth is surrounded by televisions. Wherever you look, there is sports on TV. 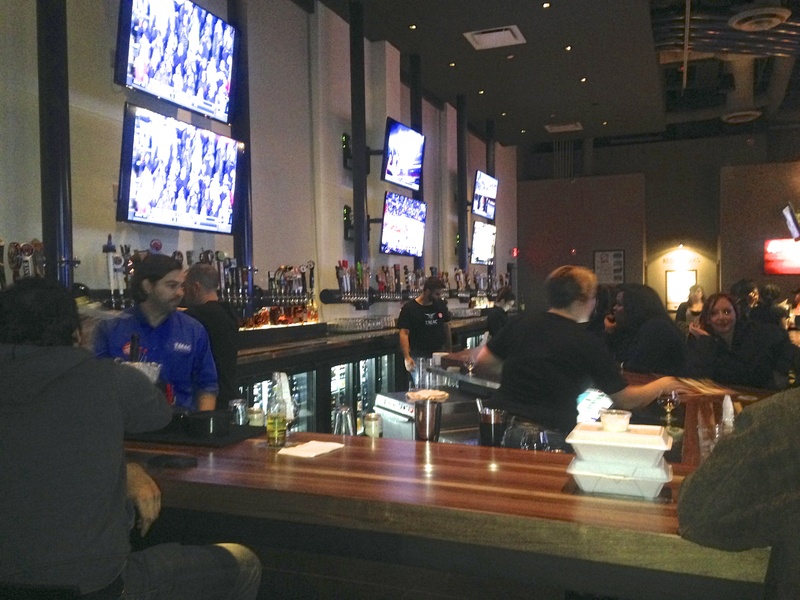 At World of Beer, you are surrounded by TVs, not immersed in them. It’s hard to see the game from some of the seating areas. Advantage: T. Mac. You want to be in the game, not near it. T. Mac always impresses, with 100-150 taps, no matter the location. Here’s just a few of them. 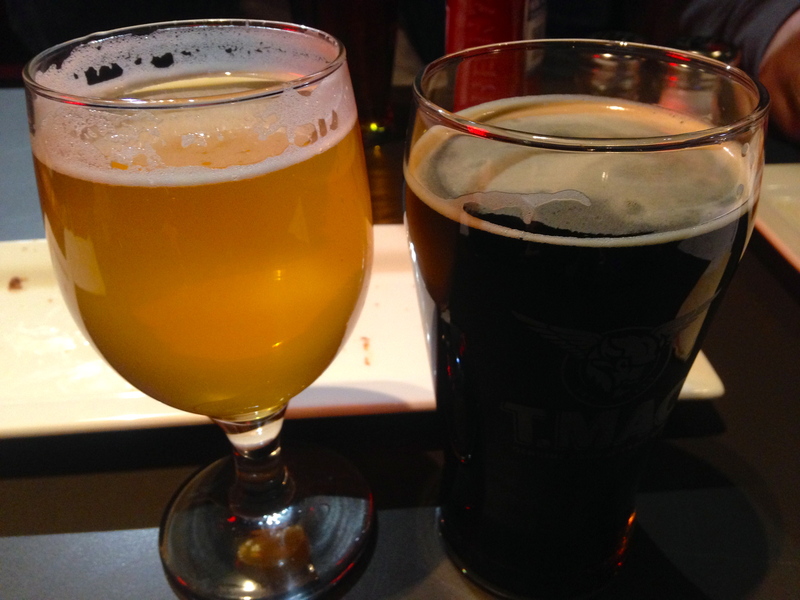 We order a Red Hare Sticky Stout and an Allagash Victoria. It was a tough decision to make. The Red Hare is made in Marietta and is a good, local choice. The Allagash is made with white grapes in the mash, which gives it an interesting flavor. 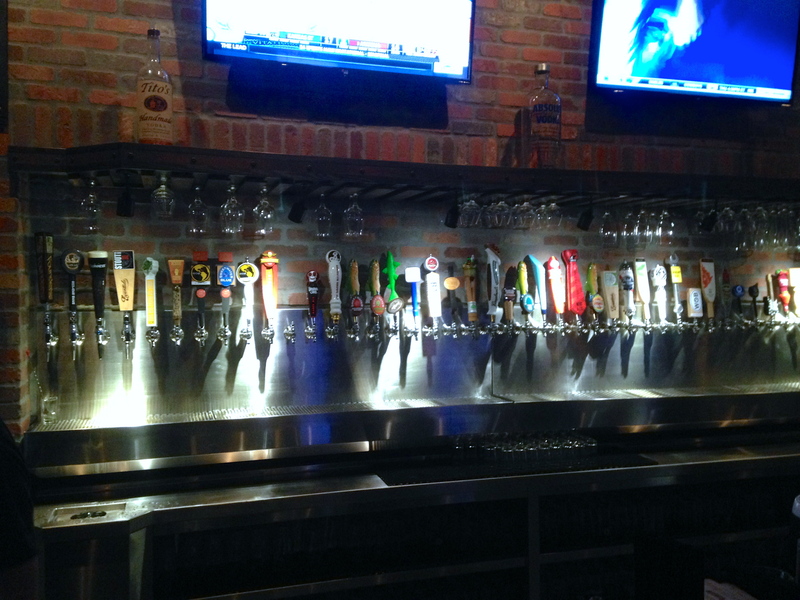 World on Beer “only” has 48 taps. We are joined tonight by our son Elliott and the lovely Skye from Atlanta Eats, which gives a good chance to taste more beer, and get more food pictures later. 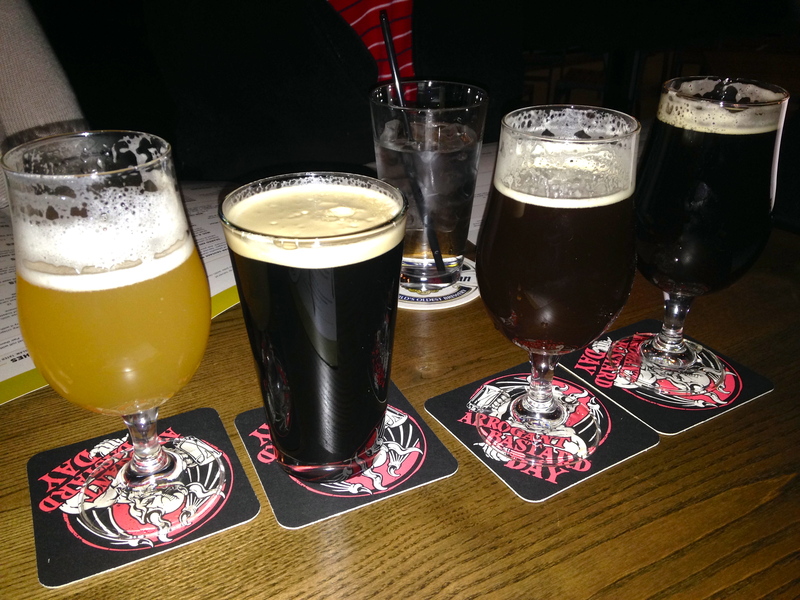 From left to right, we order an Orpheus Atalanta (that’s how they spell it), a Boulder Chocolate Shake, St. Bernardus Christmas, and a Red Brick 21st Anniversary. I liked the Red Brick best as it is aged in rum barrels. Notice the discrepancy in the pours, though. They all should have been the height of the Red Brick on the right. The bartender was too lazy to get more beer in the glasses. And when you are paying $8 a pop, the glass should be full. Advantage: T. Mac. They win on quantity alone. And they fill the glass to the top. They claim to have 500 different beers in there. How do you ever decide what to order? With the iPad that they bring to your table, that’s how. They rank them by price, style, country of origin, and color just to name a few. It’s a pretty cool system, but don’t expect to make a quick choice because there are so many. Advantage: World of Beer. 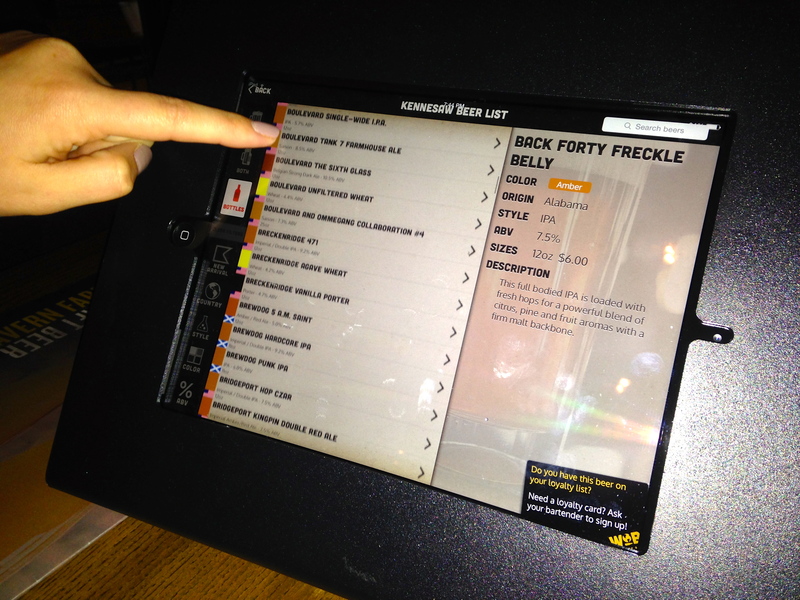 The iPad is a great tool for those who know beer, and those who don’t. Both menus are similar. 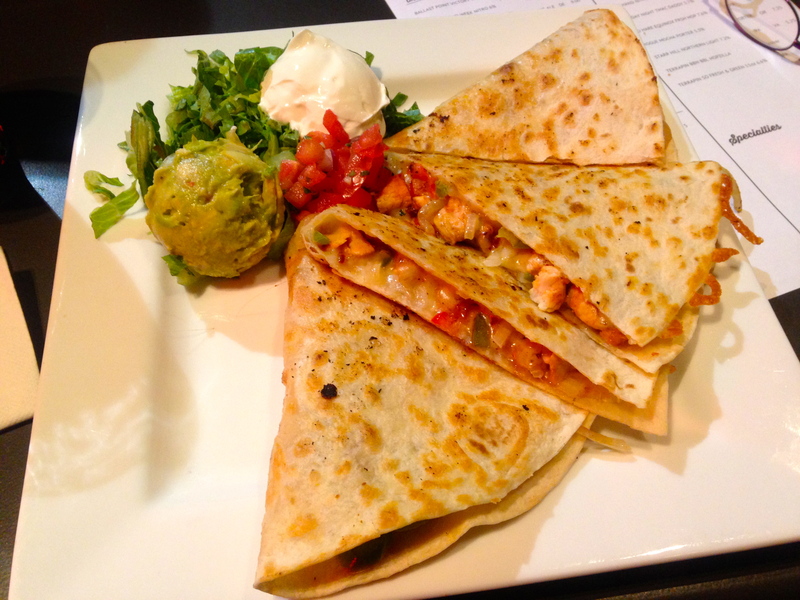 Wings, burgers, sandwiches, Mexican staples and flatbread pizzas are the main attractions. At T. Mac, Eve orders a chicken quesadilla without the peppers and onions. Astute photo viewers will notice that it gets delivered with the peppers and onions. This one got sent back. The second one was correct. 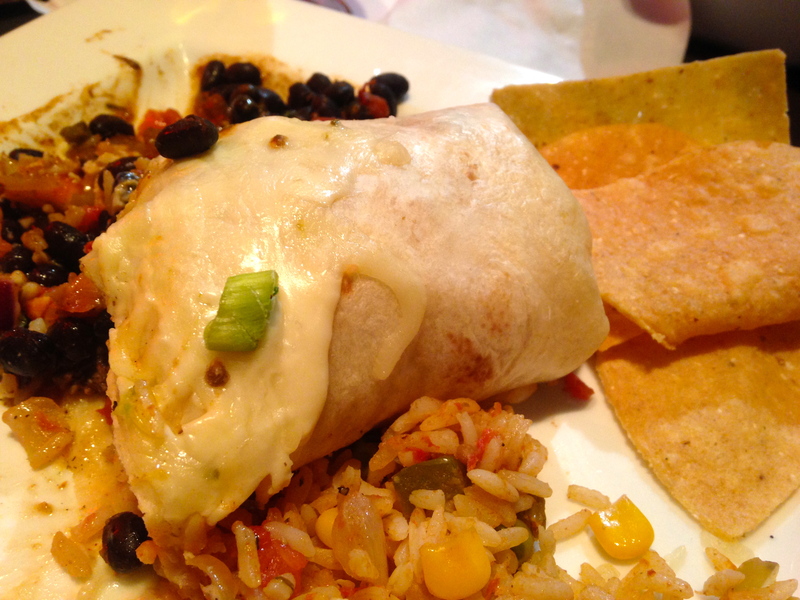 I order the steak burrito. It’s big and a lot of food. Our apologies for not taking the picture earlier, but we were really hungry by the time it came out. Over at World of Beer, the food seems much more creative. 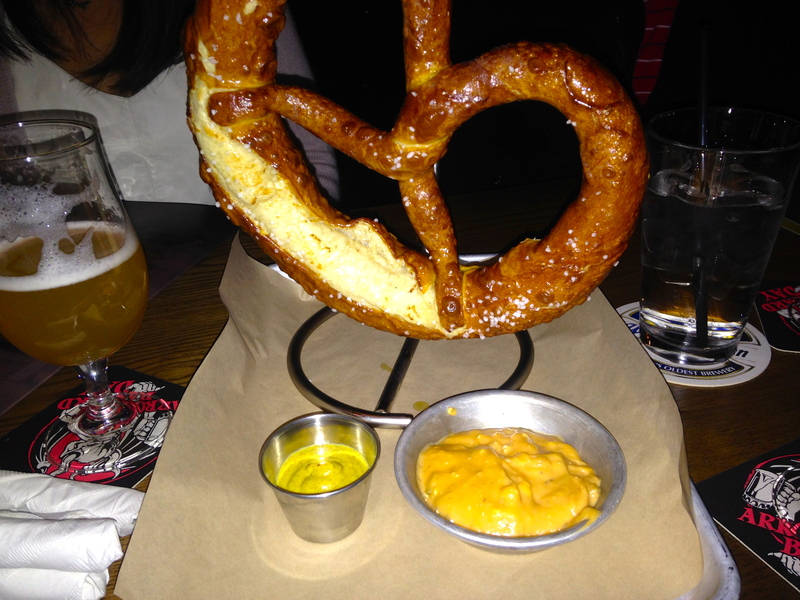 Like the soft pretzel, the perfect appetizer to share with your cold beer. They charge a little extra for the beer cheese sauce, but it’s worth it. We all order something with a bun on our visit. 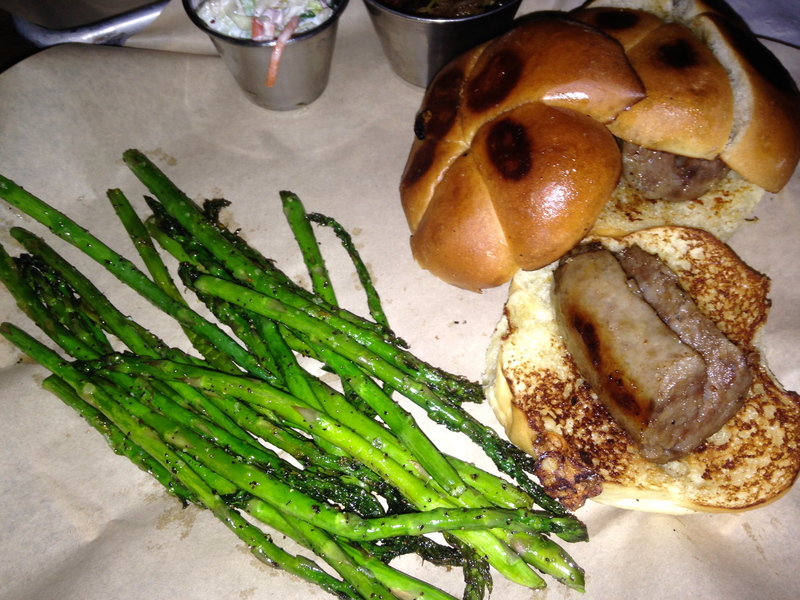 Eve gets the bratwurst sliders on a pretzel bun. The brats, of course, are made in Guinness. They look a little skimpy because she gets the onions and peppers on the side. Skye orders the steak sandwich. 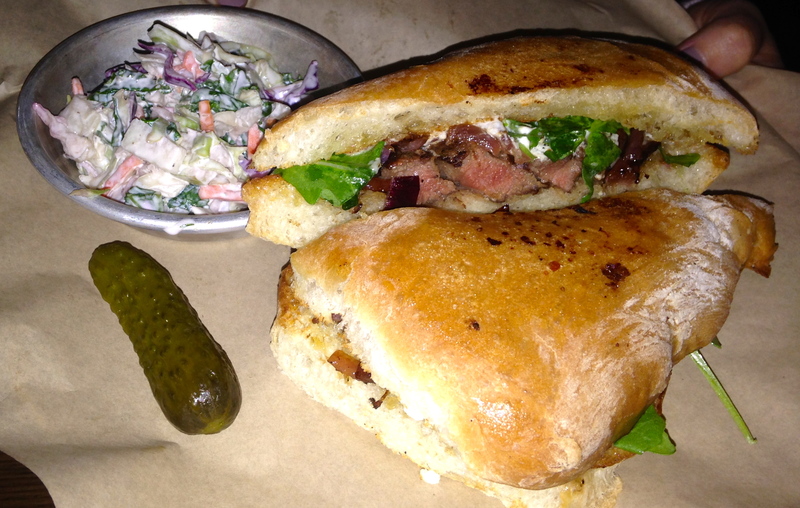 This one features onions, arugula, and goat cheese on herb foccacia. 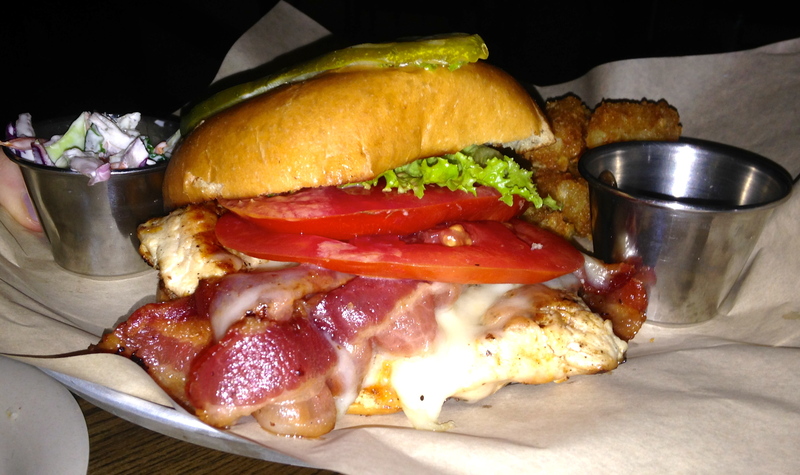 The chipotle chicken sandwich looks good too. Our son Elliott orders this one and he really likes it. When in a beer bar, why not try a Chimay burger? 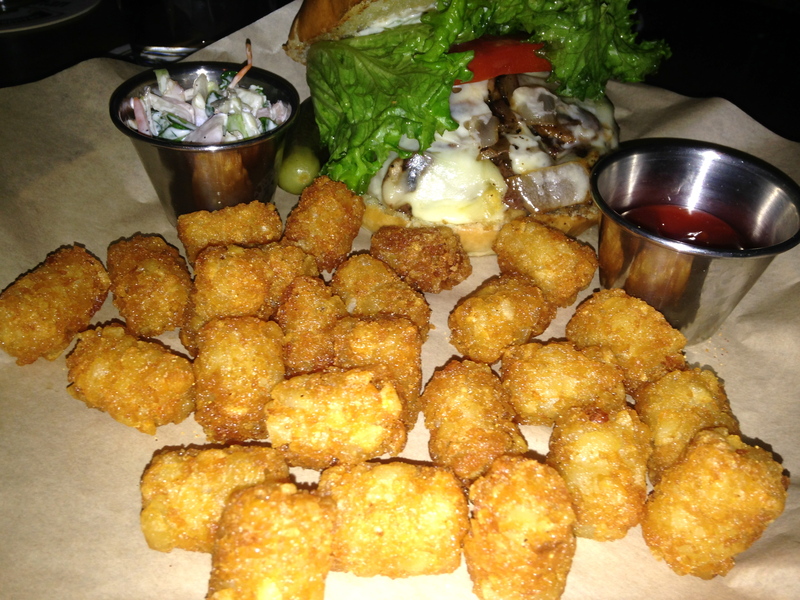 Although this is a better picture of the tater tots than the burger, I must report that this is a fine hunk of meat. It’s covered in Swiss cheese and mushrooms and that excellent Chimay sauce. You won’t ever read about this burger on a top 10 list in Atlanta, but it’s worth getting if you visit. Advantage: World of Beer. Sorry, T. Mac, but the newcomer tries a little harder in the kitchen and succeeds. T. Mac is busy on our visit. Good for them, bad for us. It takes forever to get beer and even longer to get a couple of glasses of water. We are expecting a long wait for food, but it comes out surprisingly fast. The crowd is more manageable at World of Beer. Our server does a much better job here. Advantage: World of Beer. Date Night drinks a lot of water and never wants an empty glass. The World of Beer! Adding up the scores, it looks like the underdog challenger has narrowly defeated the champion by the score of 5-4. That’s pretty close in our unscientific contest. The bottom line is this: if you are going to watch the game and have some beers, go to T. Mac. 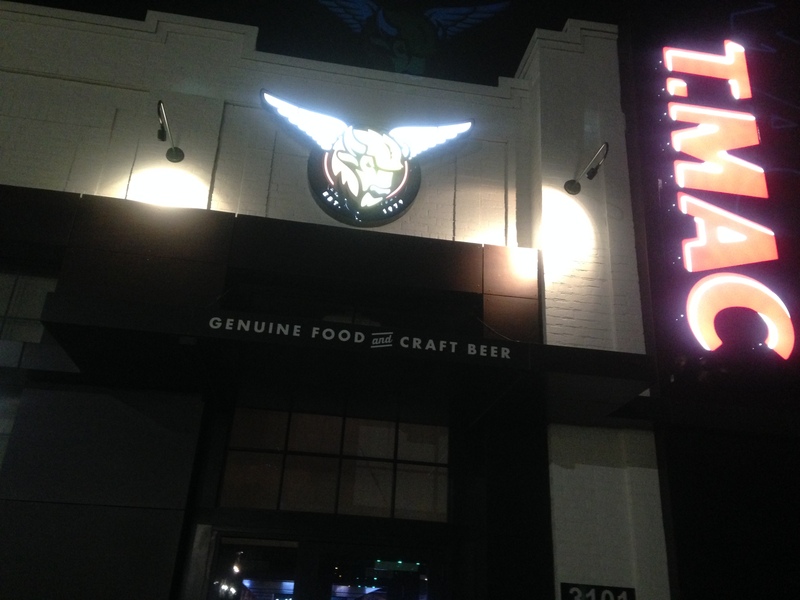 If you are going for the food and the service, World of Beer is better. 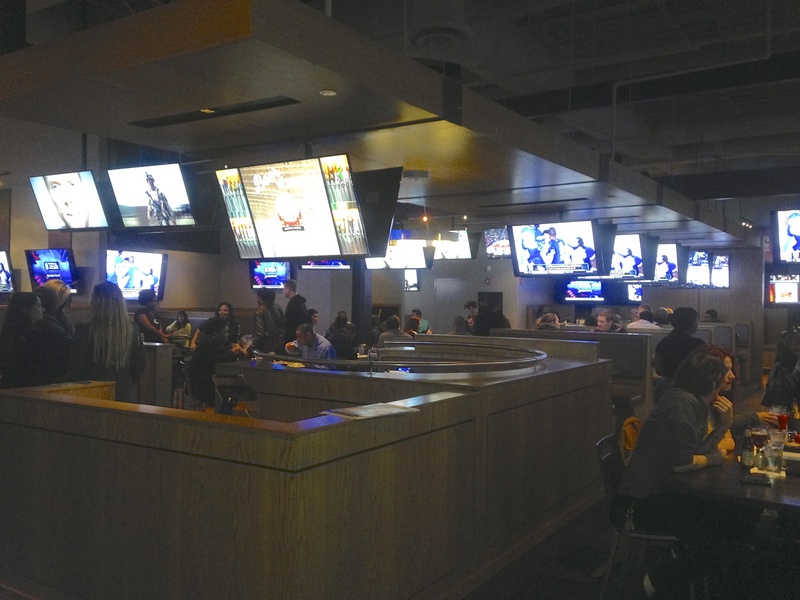 Either way, you will probably have an enjoyable sports bar experience.